Educational Qualification : Passed 10th/12th/Diploma/Graduation in Concerned Discipline from any Recognized Board/University. Eligible Candidates can Submit Application at the Official Website of SSC latest by 12th October 2018. 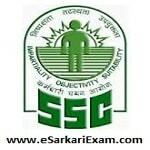 Applicants First Logon to SSC or SSC Online Official Website. Open and Read Notice Link and Check Eligibility Details.